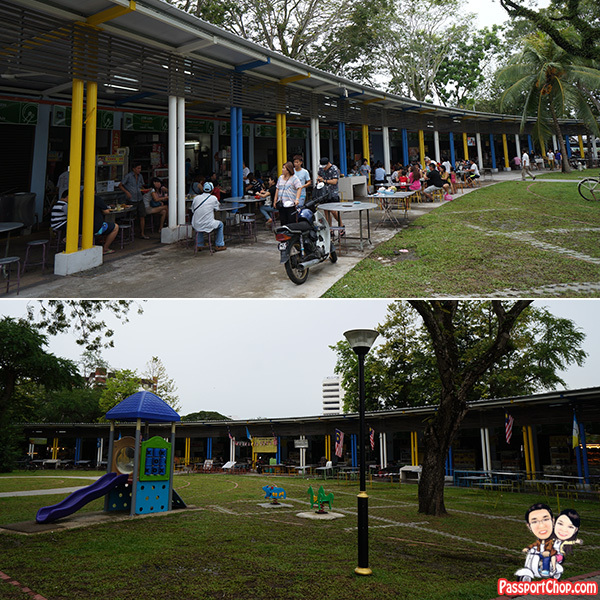 Continuing from Part 1 of our food adventures around Penang at New Lane Food Court and Joo Hooi Cafe, we checked out other highly recommended food e.g. Bangkok Mee Goreng from Pulau Tikus and Seafood Popiah from Padang Brown food centre and also compared 2 famous Char Kway Teow stalls in Georgetown, Penang. We started with Bangkok Lane Mee Goreng which is a 15-minute drive away from our hotel (at Hotel Jen Penang). 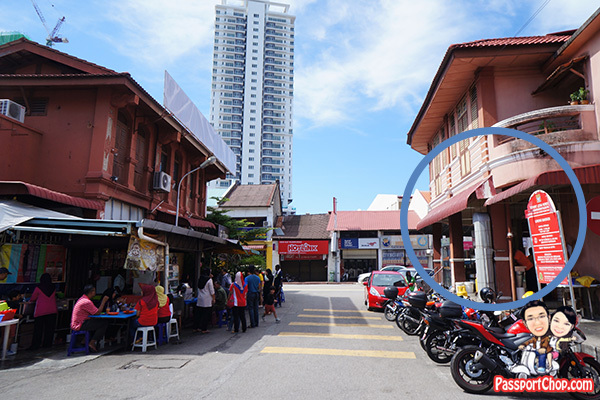 The stall is located in a coffeeshop (circled in blue below) – I think it is called Seng Lee coffeeshop. When you turn in from Jalan Burma into Lorong Bangkok (or Bangkok Lane), the coffeeshop is on your left. Here at this coffeeshop, the menu is just mee goreng or mee rebus and pricing differs according to the ingredients that’s added to your mee goreng/rebus e.g. the cheapest is mee goreng/mee rebus (kosong) at RM3 (no ingredients) to most expensive of mee goreng/mee rebus with tambah sotong (add more sotong than the usual mee goreng with sotong dish) at RM7. 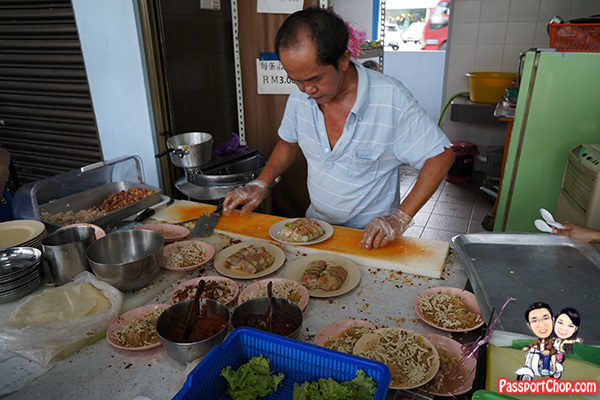 When we were there on a Sunday morning (10+am), there were still available seats in the coffeeshop but the mee goreng uncle (the one you see in the picture below) was very busy frying the mee goreng to meet the high volume of orders. I think there were many orders coming from the customers sitting on the opposite side of the coffeeshop (see picture above on the left). This is our plate of mee goreng (sotong and telur) i.e. mee goreng fried with squid and chicken (RM5). Quite different from the mee goreng in Singapore – for a start, the noodles used is different (more like mee kia noodles than the thick yellow noodles usually used for Singapore mee goreng) but it is still well cooked i.e. not too hard. The serving size is generous – we got a plate full of noodles with lots of chicken and squid pieces. The taste is a bit more sour than the Singapore mee goreng. I can’t say for sure whether I would recommend this dish because this is maybe what a Penang mee goreng would taste like 🙂 Apparently, this mee goreng stall at Bangkok Lane has been here for 80 years so there must be something they are doing right with the mee goreng. Just a 1 minute drive away along Jalan Burma and turning into Salak Moulmein, you come across another coffeeshop called 77 Food Yard. This coffeeshop is different from Seng Lee (the Bangkok Lane mee goreng one) as there are lots of different food stalls inside and even outside (mobile food carts). Here you find “Fatty Wanton Mee” stall which I strongly recommend especially if you are in the area for some Bangkok Lane Mee Goreng. 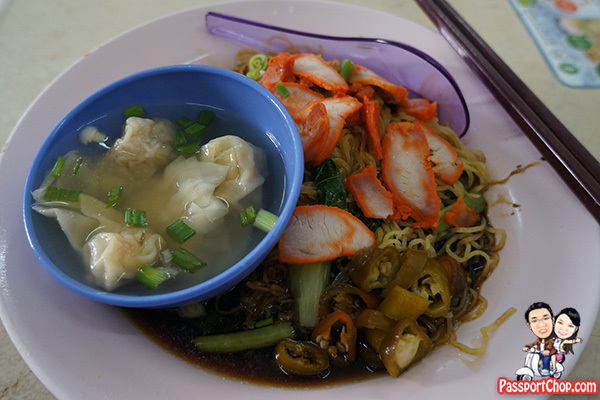 We ordered a RM4 wanton mee from Fatty Wanton Mee at 77 Food Yard – it arrived within 5 minutes – the ingredients were fresh e.g. wanton, char siew – the noodles were QQ (or springy and chewy). The taste was great especially with the noodles soaked in the black sauce base. There were also a few pork lard to complete the taste of a traditional wanton noodle. 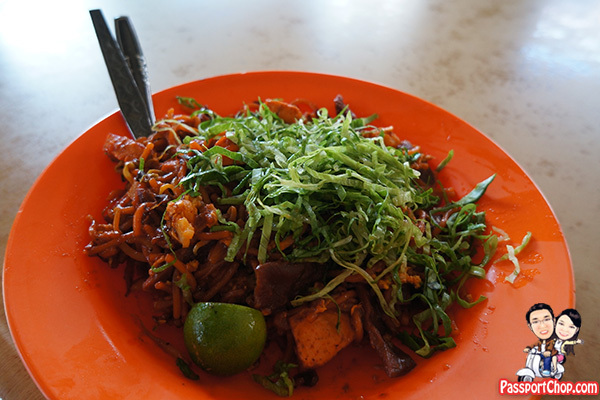 When I was researching for good Penang Char Kway Teow food in Georgetown, this Lorong Selamat Char Kway Teow stall was always mentioned – not so much for the good char kway teow but for the char kway teow lady’s reputation. Whenever a food blogger recommends her char kway teow, there will always be a torrent of comments saying that the lady is rude (the one you see in the picture below with the red hat) and her char kway teow overpriced and not worth it. 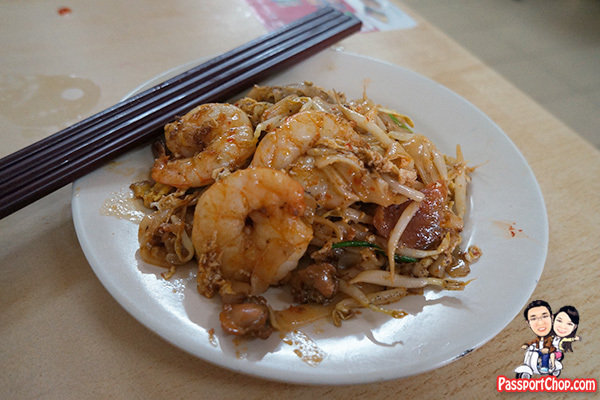 The Char Kway Teow at Lorong Selamat Cafe Heng Huat comes in three sizes – RM9.50, RM10, RM12 – a dish at Char Kway Teow here is definitely more expensive than other penang char kway teow (usually about RM6) but still there is huge demand and you can expect to wait about 15 to 20 minutes during non-peak period – much longer during peak period (lunch hours). 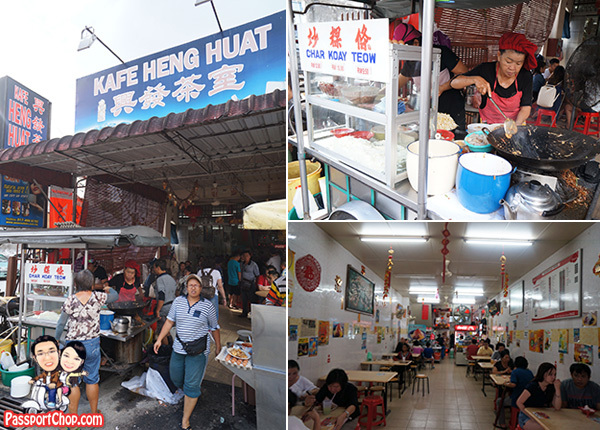 If you dine in (at Cafe Heng Huat), you are expected to order drinks – if you do not wish to order drinks, each diner is required to pay RM0.50 – this is standard practice across most coffeeshops in Georgetown. Sister’s Char Kway Teow is another char kway teow stall that comes highly recommended by many food bloggers – it is said to be packed with customers during breakfast hours – when we arrived at 11am+, we were the only customer (guess it is way past breakfast time and just before the lunch crowd). 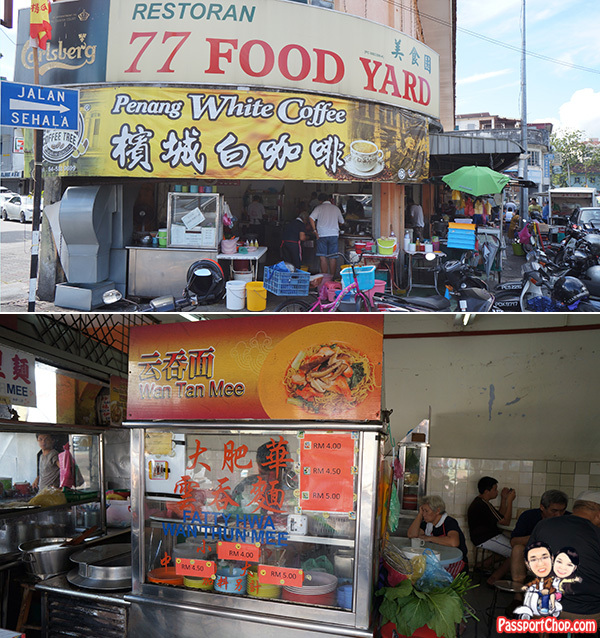 The coffeeshop name is Nan Xing and Hokkien Prawn Mee is also sold here – there is a “cover charge” of RM0.50 per person who didn’t order any drinks from the coffeeshop. This was our plate of RM4 Char Kway Teow from Sister’s CKT at Jalan McAllister. The Sister’s Char Kway Teow is also sold at RM5 for a bigger serving size. 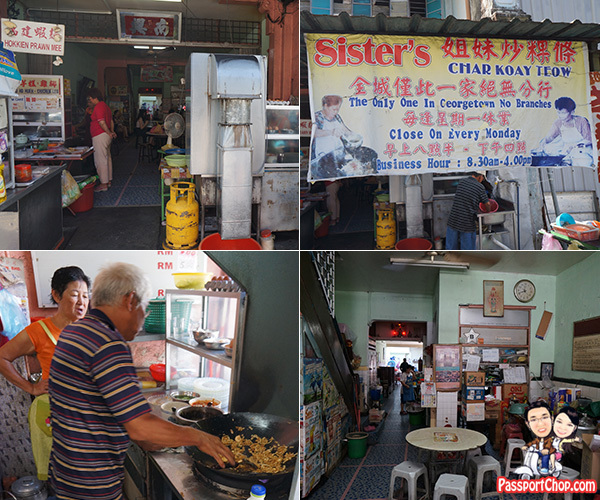 I personally enjoyed the Sister’s Char Kway Teow more than the Lorong Selamat Char Kway Teow because it is more value for money and the Char Kway Teow is much more tastier – you will find a good mix of ingredients in the Sister’s Char Kway Teow e.g. prawn, egg and then the CKT is garnished with some crab meat (see the white bits in picture below). 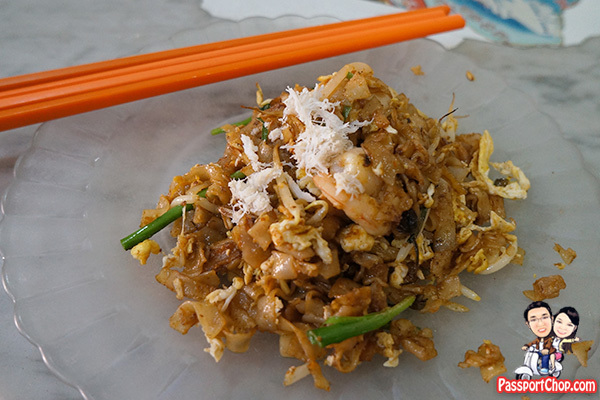 Unverified but mentioned by many food bloggers – apparently the Sisters in the Sister’s Char Kway Teow are no longer cooking the Char Kway Teow. Now you will find an elderly man cooking the CKT instead (see picture above). He is the son or nephew (unconfirmed) of one of the ladies (the Sisters) which have stopped cooking as she was over 70 years of age now. The other half of the Sisters CKT brand – her sister have passed away. Padang Brown Food Court is about a 6 minutes drive away from Hotel Jen and here you can find lots of good food in what looks like a much more hygiene dining environment compared to New Lane and other more open food stalls. The entire food court is shaped like a semi-circle and divided into 2 quadrants – one side is selling halal food and the other side is selling other non-halal food (see picture below). Gerai Gerai Padang Brown Food Court is known for many good food e.g. 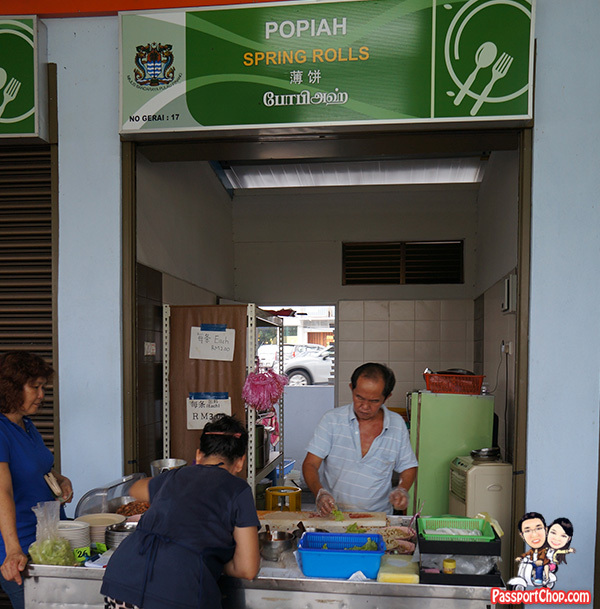 Yong Tau Foo, Lok Lok but the most famous one has to be the Seafood Popiah – expect long wait times (of about 30 minutes) – if you are dining at the food court, just order your popiah and they will deliver to your table. The seafood popiah is sold at RM2 and to add more ingredients will cost RM3. I strongly recommend the “add more ingredients” option (RM3) – I was hanging around watching the popiah uncle pack the popiah to verify a claim by one of the bloggers – i.e. the RM2 option excludes crab meat. I can confirm this – for just RM1 more (S$0.30), you get a generous sprinkling of crab meat with your popiah and the crab meat is not those pre-processed crab meat nonsense you can buy from NTUC (the red and white sticks of crab meat), these are real white fresh crab meat so it is worth every cent to top up (actually 30 of these cents :-p). 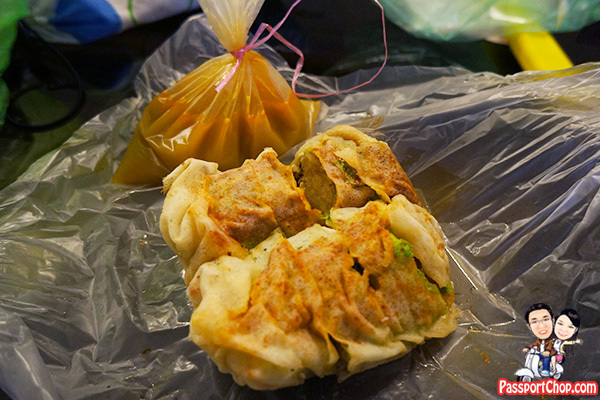 The popiah is thick and packed with delicious ingredients – the bonus is the soup that is poured over the popiah – the soup is like those prawn mee har mee soup base – very flavourful and tasty. I really loved these seafood popiah and I super strongly recommend them and remember to order the RM3 (add more ingredients version)! 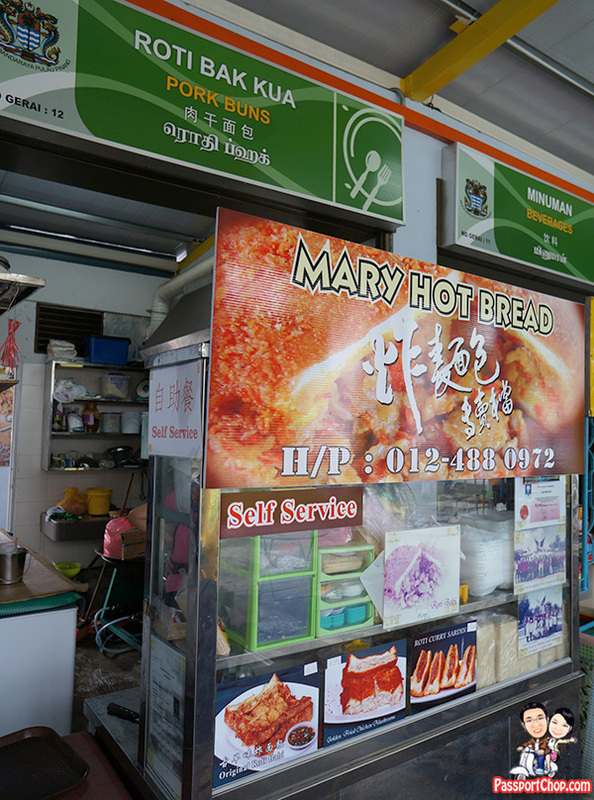 Another stall I strongly recommend is the Mary Hot Bread Roti Babi stall – this is a hidden gem -very few other food bloggers recommend this but it is another must go when you are at Gerai Gerai Padang Brown. 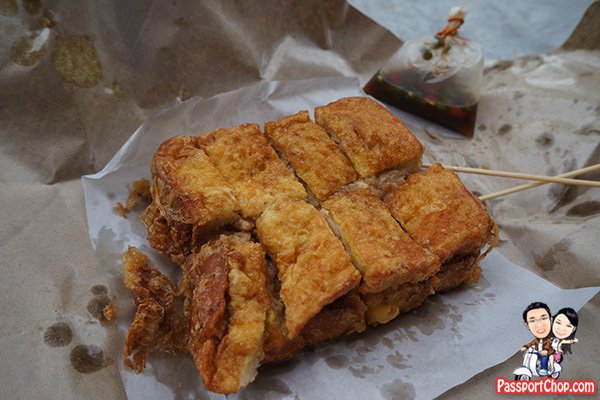 The Roti babi is like French Toast with pork fillings – very tasty and sweet. make sure you try it with the chili (Bread with Chili, i know not a typical combination but trust me, it is a must try combination!) – this cost RM6 – worth every dollar. Next time if i drop by Gerai Gerai Padang Brown, I will try this stall’s other dishes e.g. Golden Fried Chicken Mushroom (RM6.50). Different sites put up different opening hours of Gerai Gerai Padang Brown – i guess it is up to individual stalls but it seems the common thread I am seeing is it is closed on Alternate Monday and all Thursdays – on all other days, it is open from 2pm til late (some say til 8pm). So my recommendation will be to go on Tues, Wed, Fri, weekends from 2pm til 6pm – but expect crowds during dinner time and weekend. Hello! May I know if you have any driver to recommend to bring us around in Penang?